← ‘Phantom Effect’ is LIVE! Psychological obsession and surrealist complexity lend interest to fetishistic violence in a perverted parable that challenges traditional moral norms and reader expectations. When serial killer Jonathan Deseranto gets a flat tire, an unexpected encounter leads to an automobile accident that, in turn, reveals the animated corpse of Marissa Madison, his most recent victim. Cast into a purgatorial time loop and forced to inhabit Marissa’s life as well as his own, Jonathan realizes his victim had “gifts he didn’t know about.” Reliving Marissa’s domestic strife and enduring grim reunions with his abusive mother, Jonathan becomes both hunter and prey. Razor-sharp description, breakneck action, and sympathetic characters undermine the reader’s preconceived notions of past and present, and of reality and delusion, in a thriller designed to question as much as entertain. The genre staple of a killer’s psychosexual metamorphosis is invigorated by the theme of a fragmented identity haunting itself. Perspective shifts lend depth to a philosophically rich fearfest that’s recommended for readers who prefer their titillation to include some complexity. Michael Aronovitz is the author of the acclaimed short story collections Seven Deadly Pleasures (Hippocampus Press, 2009) and The Voices in Our Heads (2013), Alice Walks (2013), as well as the novel, The Witch of the Wood (Hippocampus Press, 2014). This entry was posted in Books, Ghosts, haunting, horror, Thriller and tagged Book, ghost, Haunted, horror, Killer, Michael Aronovitz, New Release, Novel, Phantom Effect, Terror, Thriller, Trapped. Bookmark the permalink. 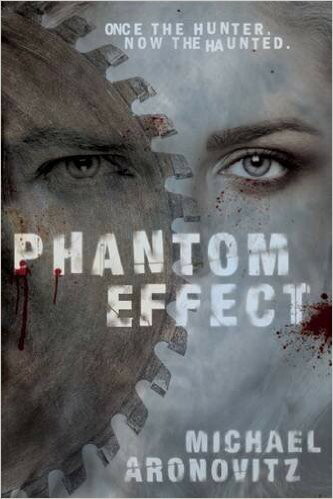 2 Responses to Phantom Effect – My Latest Release! Super excited to start reading this!